The Pieridae are a large family of butterflies. They are known as Whites, Yellows, or Sulphurs. This family has about 76 genera and 1,100 species. They are mostly from tropical Africa and Asia. Most pierid butterflies are white, yellow or orange with black spots. The pigments that give the coloring to these butterflies are derived from waste products in the body. They are a characteristic of this family. It is believed that the name "butterfly" originated from a member of this family, the Brimstone Gonepteryx rhamni. It was called the "butter-coloured fly" by early British naturalists. The sexes are usually different, often in the pattern or number of black markings. The caterpillars of a few of these species, such as Pieris brassicae and Pieris rapae, feed on brassicas. They are commonly seen in gardens and are agricultural pests. Males of many species feed on salts from moist soil. They do this in groups. This behavior is known as mud-puddling or puddling. The Pieridae have the radial vein on the forewing with 3 or 4 branches and rarely with 5 branches. The fore legs are well developed in both sexes. The tarsal claws are bifid (bifid means split into two parts). Like the Papilionidae, Pieridae also have their chrysalids held at an angle by a silk girdle. The girdle runs around the first abdominal segment unlike the thoracic girdle seen in the Papilionidae. Dismorphiinae (6 genera) They are mostly neotropical. This group includes many mimetical species. The host plants are in the family Fabaceae. Pierinae (55 genera) This subfamily includes the Whites and Orange-tips. Many of these species are strongly migratory. Their host plants are in the families Capparidaceae, Brassicaceae, Santalaceae, and Loranthaceae. Coliadinae (14 genera) This subfamily includes the Sulphurs and Yellows. Many of these species are sexually dimorphic. Some species, such as in the genus Colias, have wing patterns that are visible only under ultraviolet light. Pseudopontiinae The main species in this subfamily is Pseudopontia paradoxa. It is endemic to West Africa. ↑ 1.0 1.1 1.2 1.3 1.4 DeVries P. J. in Levin S.A. (ed) 2001 The Encyclopaedia of Biodiversity. Academic Press. Braby, M. F. 2005. Provisional checklist of genera of the Pieridae (Lepidoptera: Papilionidae). Zootaxa 832: 1–16. Braby, M., R. Vila, and N. E. Pierce. 2006. Molecular phylogeny and systematics of the Pieridae (Lepidoptera: Papilionoidea: higher classification and biogeography. Zoological Journal of the Linnean Society 147(2): 239-275. Carter, David. 2000. Butterflies and Moths (2/ed). Dorling Kindersley, London. ISBN 0-7513-2707-7. 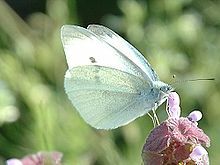 Wikimedia Commons has media related to Pieridae. Wikispecies has information on: Pieridae. Pteron In Japanese but binomial names 3 pages of images. Tip Next page.